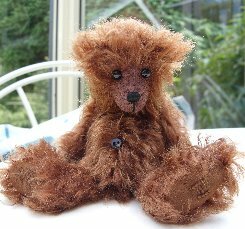 This is Porth, he is a gorgeous 6" bear made of deep chestnut brown South African mohair, perfect for those of you who love your bears to be real bear colours. The fur is a deep rich colour and has a nice tufted texture. His pads and paws are made of toning cashmere, he has a black stitched nose and shiny black German glass eyes. In style, Porth has straight arms, short legs with tapered footpads and his head is set quite low on his shoulders which makes him look a little sad. He is filled with steel shot so he is nice and heavy and quite floppy with his joints quite loose. He is lovely and has a very sweet face. Porth costs £50 plus postage. Please note that as with all our bears, Porth is not a toy and is not suitable for children. Sorry - Porth has been adopted.